The RK619WALL Wall Mounted 6U Server Rack/Cabinet can be fastened to most types of walls and features a sturdy, compact design that can be positioned almost anywhere without wasting valuable floor space. This TAA compliant product adheres to the requirements of the US Federal Trade Agreements Act (TAA), allowing government GSA Schedule purchases. This equipment rack offers 6U of storage space and is designed to accommodate 19-inch (wide) servers, networking and telecom equipment. 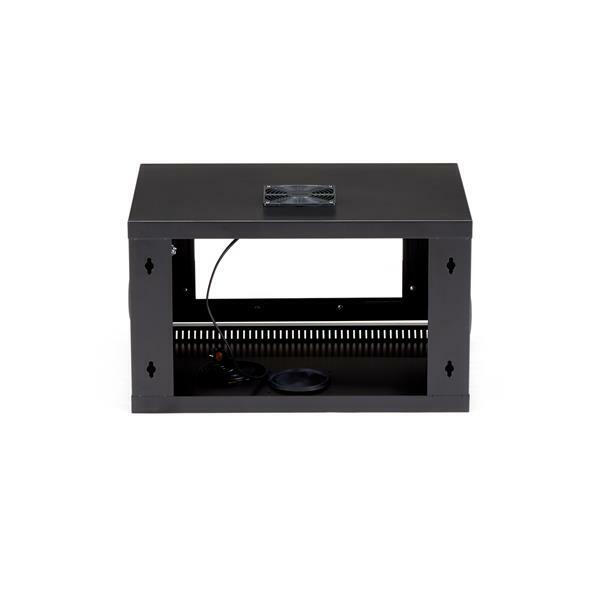 The rack features a 12cm fan, with ventilation positioned above and below the front panel glass door, helping to keep dust out of the rack while ensuring a cool operating environment for your valuable equipment. 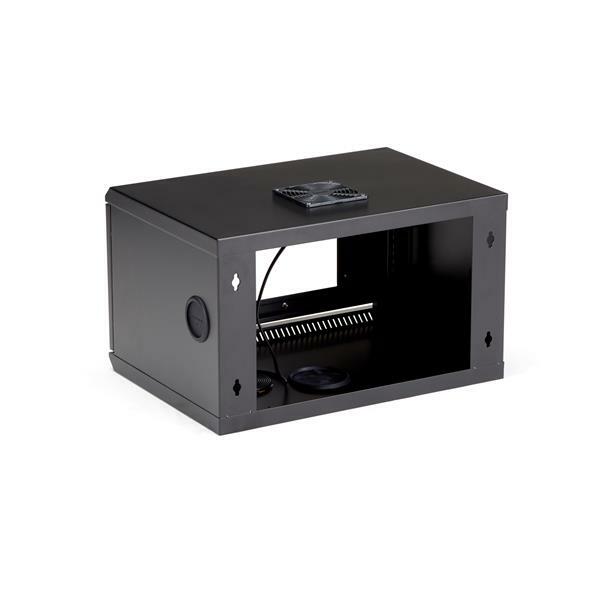 To ensure optimum security and prevent tampering with the enclosed equipment, the cabinet/rack features a lockable, smoked acrylic front door that can be removed entirely or installed to open to the left or right as needed. Backed by a StarTech.com Lifetime warranty. How can I tell if a shelf will fit in a server rack? If a server rack accessory is listed on a server rack's product page under the Accessories tab, it will fit in the server rack. Server racks offered by StarTech.com have an industry standard width of 19 inches, but can have varying height and depth. The mounting depth is important when you choose a shelf to be used as an accessory. Shelves that mount on all four corners of a server rack, such as 4-post server racks and cabinet server racks, will all have a maximum mounting depth. Many of these server racks and shelves are adjustable, which means that there will be a minimum and maximum mounting depth. This information can be found on individual product pages under the Technical Specifications tab. It is important that the depth of the shelf is compatible with the server rack's minimum and maximum mounting depths so that it can be mounted. If a shelf only mounts on the front on a server rack, the mounting depth is not relevant as long as there is enough clearance behind the mounting point to accommodate the full depth of the shelf. What is a server rack, and how can I tell if it will work in my setup? Server racks are a great way to organize small spaces that require a lot of technology packed into them. However, there are a few important things you need to keep in mind before making a purchase. Today we will be explaining what a U is, and the differences between 2 and 4-post and open and closed server racks. We will also be covering what minimum and maximum mounting depth mean to you. A server rack unit, or U, is a unit of measurement used to describe the amount of equipment space a server rack has. A U is 1.75 inches or 44.45mm high. An 8u rack has 8 units of vertical server rack space. Note: Equipment can be more than 1U in size. When you purchase server rack accessories they will list their size in U’s. Make sure the server rack has space to accommodate the accessory. StarTech.com sells 2-post and 4-post server racks. 2-post racks take up less space but generally do not have as high of a weight capacity. 4-post server racks can be open or closed. Open racks are more accessible than closed racks, while closed racks can be locked for security purposes. Closed racks can include glass or mesh variations. closed server racks are generally better at reducing equipment noise and also limit external access. Mesh server racks provide better unmanaged airflow. Adjustable 4-post server racks have a minimum and maximum mounting depth. The minimum mounting depth is the shallowest you can construct it. The maximum mounting depth is the longest measurement a product can be while still fitting in the server rack. If the server rack is adjustable, this measurement is also the deepest it can be constructed. Keep in mind that when you install equipment that is close to the maximum mounting depth, there will be little to no room for cable management at the back of the rack. Server rack accessories my have their own minimum and maximum mounting depths listed on the product page under the technical specifications tab. It is recommended that you confirm these measurements will work with your server rack. You can mount equipment on both sides of a 4-post rack, provided the combined measurements of both items are under the server rack's maximum mounting depth. Decide if you want casters on your server rack, want your rack bolted to the floor, or if you want to leave it free standing. 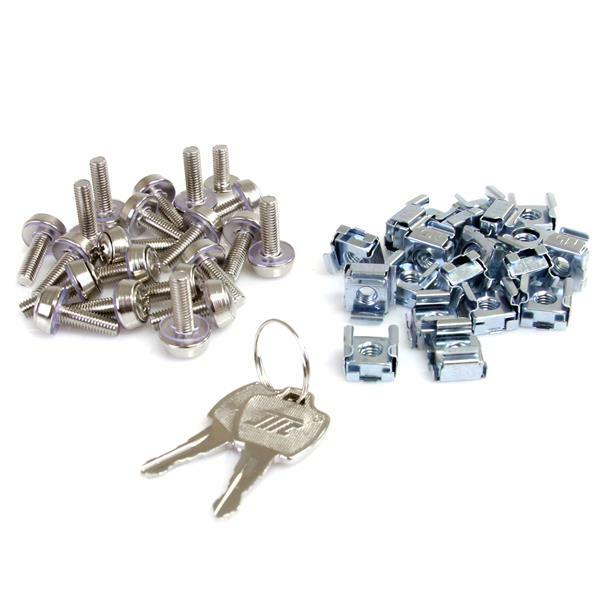 StarTech.com offers racks that come with casters and racks that you can bolt to the floor. StarTech.com also sells casters separately. 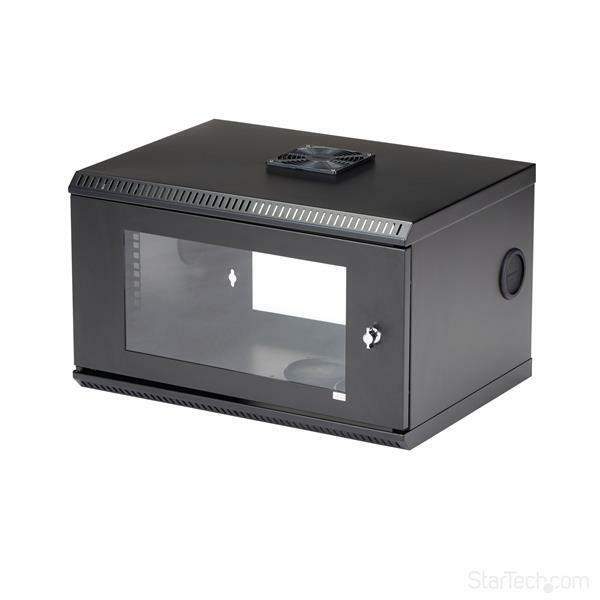 Casters that fit on your server rack will appear on the StarTech.com product page under accessories. What server rack accessories are available for my server rack? There’s a wide variety of accessories for server racks and today the various options will be explored. Here are the accessories that will be discussed. Server rack shelves come in a variety of sizes and styles. We will be covering six different types of server rack shelves. Server rack shelves have both a U size and depth. The U size describes the height of the shelf in rack units, and one U is equal to 1.74 inches. Shelves might also list a maximum suggested weight and some shelves are available in a vented design for greater airflow. Fixed shelves have a fixed depth. If you use a server rack with fixed shelves, make sure your rack equipment fits within the mounting depth of the shelf you are purchasing. Unlike fixed shelves, you can adjust the depth of adjustable shelves. The minimum and maximum mounting depths for adjustable shelves are listed on the product page, under the Technical Specifications tab. Sliding shelves can be slid in or out of a server rack. These shelves have a lock feature that locks the shelf and prevents it from accidentally falling out or sliding back into the server rack. The minimum and maximum mounting depths for sliding shelves are listed on the product page, under the Technical Specifications tab. Similar to sliding shelves, drawer shelves feature a sliding storage drawer that is perfect for storing tools, small hardware or other accessories. Cantilever shelves do not attach to the server rack on all 4 corners; instead, they only attach on one side of the server rack. These shelves generally have lower weight thresholds. Heavy duty shelves are designed to hold more weight. They are a more durable solution for storing large pieces of equipment that can’t be mounted in a server rack. Startech.com offers both rack rails and DIN rail kits. Rack Rails are available in several different U sizes and are often adjustable, allowing you to customize the depth of your server equipment. DIN Rails are an industry standard for server rack equipment, and StarTech.com offers a DIN Rail kit which fits all standard 19” racks. This kit features adjustable depth and the entire kit occupies 2 U’s of rack space. As with other server rack accessories, check on the product page under the Technical Specifications tab to make sure your equipment will fit within the product’s measurements. Casters and levelling feet are two of the commonly used methods of mounting a rack on the floor. To determine whether your rack includes casters or levelling feet, on the product page, check the Technical Specifications tab, under the heading What’s in the Box. Cable management accessories include cable management hooks, panels, and conduits or ducts. More information will be shared on them below. Cable management hooks are designed to hold cabling to avoid cable knotting or crimping. They are also sometimes referred to as D-Ring hooks and can be found in a variety of sizes. Cable management ducts or conduits are used to route cables through a covered cable duct. These ducts feature a removable top cover so that you can easily add or remove cables. A cable management panel consists of several cable management hooks and/or ducts, combining these products for an all-in-one cabling solution. Rack blanking panels are sometimes called filler panels as they are designed to fill the openings in server racks that are not in use. This provides security as well as physical protection for the equipment in the server rack. Rack blanking panels can be vented or solid and come with or without hinges. Power distribution units or PDU’s add additional power outlets to your server rack. They are available in U based sizes, such as 1U and some of the more advanced units include power switching, which you can use to power on and off the connected devices over an IP network. Confirm the number of outlets and the U size you need in your server rack PDU before you make a purchase. There are a few ways you can find information about server rack accessories on www.StarTech.com. To view the different families of server rack accessories, go to the StarTech.com website. Under Server Management, click Server Rack Accessories. This opens a page with each family of server rack accessories. On individual product pages, you can view an image gallery which includes detailed pictures of the product. The Technical Specifications tab includes the product's dimensions, and what comes with the product. The Accessories tab lists other products that are confirmed to work with the product you are viewing. If you have questions about any StarTech.com server rack accessories, contact our technical support team for further assistance. How do I build a server rack? In this video, guidelines and best practices will be discussed for constructing server racks. Constructing a new server rack can be a bit daunting, but there are some general guidelines that you can use when you assemble most of the server racks StarTech.com sells. Let’s have a look at the guidelines. Make sure there’s enough room where you will be building. If you intend to move the rack, make sure it will fit through any doors or hallways. Make sure that you have all of the parts listed in the manual. Make sure that you have all of the tools that you will need. Assemble the rack in the correct order, according to your manual. Double-check that everything is where it should be and then tighten everything down. Be careful not to strip screws. Install casters and any server rack accessories. Now that you have reviewed the guidelines, you can begin assembling the server rack. It is advised to take all of the parts out of the box and ensure they match up with the parts outlined in the manual. You should also make sure that you have all of the tools that you need. First, the adjustable beams should be assembled. On this server rack, these adjustable beams control the depth of our rack and are marked with Index numbers. The Index numbers allows you to set the depth of your rack, based on your equipment. Make sure that you choose the same Index numbers for all of the adjustable beams. You can use the measurement chart in the manual for reference. As you screw in your first screws, it is a good idea to only tighten them finger tight. That way, if you need to unscrew anything, you can do so easily. You should now have your adjustable beams together. You will now use the beams to line up one set of left and right vertical rails and the top and base brackets. It is often easiest to build the rack on its side. Make sure that you refer to the manual for the fastening pattern as this is crucial to the rack’s stability once it is assembled. The same fastening pattern will be used for the other corners of the server rack. For this rack, you can see that the screw is going through the top or base bracket, then the vertical rail, and then into the adjustable beam, in that order. This is essential and will be the same for all of your corners. The two adjustable beams, two of the vertical rails, and the top and base brackets should all be in place now. You can now attach the other two vertical rails and our final two adjustable beams. It’s time to double check that everything is in the right place before you tighten all of the screws. Make sure that the numbers on your beams are all facing in the correct direction, the fastening pattern for each corner is correct, and that all of the cable guides are facing in the same direction. Once you are sure that everything is correct, you can go ahead and tighten your screws, remember to be careful not to strip them. Now that your rack is fully assembled, you can attach the casters and server rack accessories. Note that all of your casters and server rack accessories should be installed facing in the same direction. You may find it easier to invert the server rack to install the casters. As you can see, rack builds are fairly straightforward as long as you take your time. If you experience issues in setting up your StarTech.com server rack, contact the technical support team for further assistance.